Elsa, sounds amazing, one can only dream of the wonders you have seen thus far and which are yet to come. Keep the faith; you’ll soon be there! The stars sounds amazing, something you will always remember. Seeing land after so long too. I think I would just start rowing for it! You could then just lounge on the beach until you are rescued, just like that wonderfull AA Milne poem The Old Sailor. He couldn’t because of the state he was in. For the turtles and things which you read of in books. (If he found it) a goat, or some chickens and sheep. And a very strong lock to keep savages out. He decided he couldn’t because of the sun. Was to find or to make, a large sun-stopping hat. Then he thought as he started, “Oh, dear and oh. dear! When he thought, “But I must have a boat for escape. Whereas now they might suddenly breathe in his ear! But he NEVER could think what he ought to do first. But basked on the shingle wrapped up in the shawl. He did nothing but basking until he was saved! 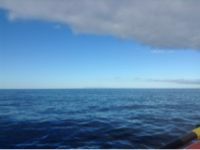 We have been monitoring your position here in Bahia Asuncion in Baja Sur and thought you should be seeing Guadalupe Island any time. You should be treated to some visits from birds, sea lions and maybe sharks! I remember the awe of those starry night at sea on night watch which was my favorite watch. It was a great time to write songs. We are getting the word out about your probably landfall here and setting things in motion logistically. We so look forward to meeting you and spoiling you for awhile. You are on the “home stretch” now Elsa…hang in there.